Baseball fans, rejoice! For anyone who says, “There are no good books out there for boys!” author David A. Kelly has an answer. The Ballpark Mysteries is an intriguing book series based on two cousins, Kate and Mike, who travel to different baseball stadiums around the country, and solve curious dilemmas at each stop. In Book Four of the series, The Astro Outlaw, the cousins travel to Houston, TX where they meet astronaut Nicholas Rice and help him find a missing moon rock. 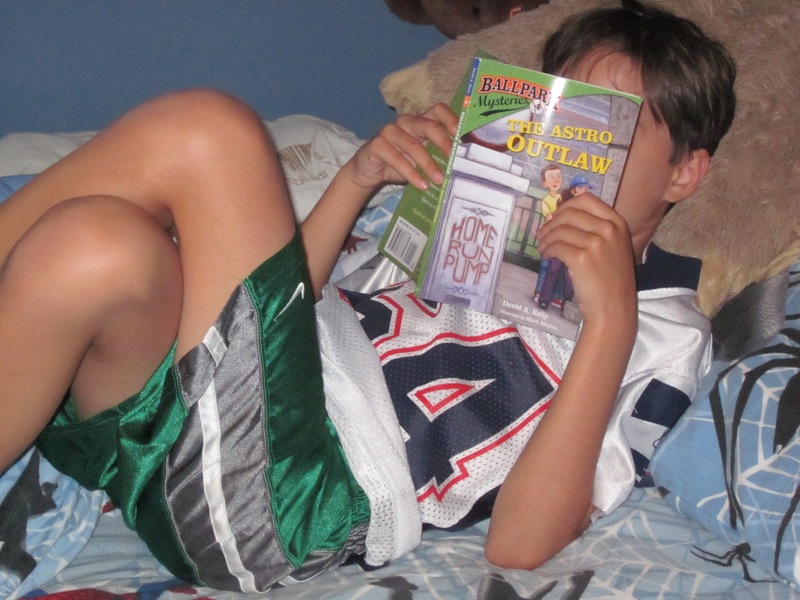 This book has all the elements a teacher or parent is looking for to interest a “reluctant reader.” Although not necessarily just for boys, The Astro Outlaw plays on both astronauts and baseball, a nice brew for the 6-8 year old set. The Houston Space Center and the Houston Astro’s ballpark are both richly described, giving young readers some juicy vocabulary to chew on. By the end of the book, I was ready to go check out the stadium, and I’m merely a lukewarm baseball fan. David A. Kelly’s obvious love for the sport and the arenas it is played in comes sparkling through. Part travelogue, the book has a unique glossary that gives further details about the baseball stadium and helps the book (and it’s readers) dip into the non-fiction genre. One other unique aspect of the book is that the main character, Mike, actually has a website you can follow, called The Dugout Scoop. This is a nice extension activity, and yet another way author David A. Kelly shows us that he understands his young audience and seeks to engage them right where their interests lie. Mystery series have a long history of entertaining children. Most of us can recall curling up with Nancy Drew or the Hardy Boys, and being glad as you finished one story that another was waiting in the wings: more clues to be followed, more adventure to come! The Ballpark Mysteries is geared toward new chapter book readers, and kids will likely want to start with book one and keep on reading. Click here to purchase or to read the latest info on the Ballpark Mysteries.